So this morning I am very sore and very uncomfortable... I am ridiculously sun burned. 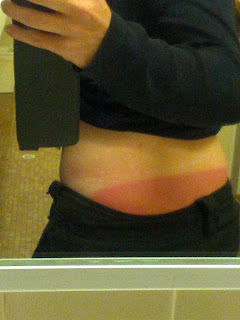 And yes I know it was cloudy, so I covered up, with t-shirt t, ¾ jeans and a hat, applied sunscreen before heading out, and once during the day. Cleary this was not enough as now I can hold my head with pride that my veggie patch, especially my vine garden actually resembles a well cared for, productive veggie patch. I can also say today I can barely even sit, lie down or move. As whilst I gallantly tackled my rainforest of a veggie patch, which was pretty much cultivating grass! Much to the pleasure of the pigs and birds, who benefited from the gardens invasion; or stripped invader. Today however, I am afraid, holding my head up, involves standing up right, which also hurts! I am not expecting any sympathy, the complete opposite. I am sure many of us have been there, at one time or another.. and we all know how stupid it is. But it just goes to show how strong the UV is in this part of the world... even when over cast. And even those who are generally conscientious about being sun smart can get caught out. Back to the plants; to my amazement the eggplant (aubergine) plants had thrived in amongst the thick grass. I guess these hardy plants, that thrive in the tropical humidity were able to grow strong and tall, and with nobody picking their fruit continued to propagate new plants. My tomatoes did not fare so well. But with a number of fallen fruit in the soil, I am sure these will flourish now they have the space to do so. What hasn’t done so well since I cleared the raised beds last week is my capsicum (pepper) plant. I am hoping some plant food and mulch over the coming week will help it recover. Other than that I have a few capsicums (peppers) in the fridge that are a little over. I have held onto them, as I want to keep and dry the seeds, for future plantings. 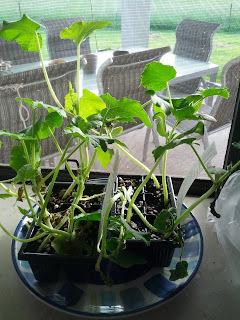 I hope to begin sowing seeds again after our interstate trip. 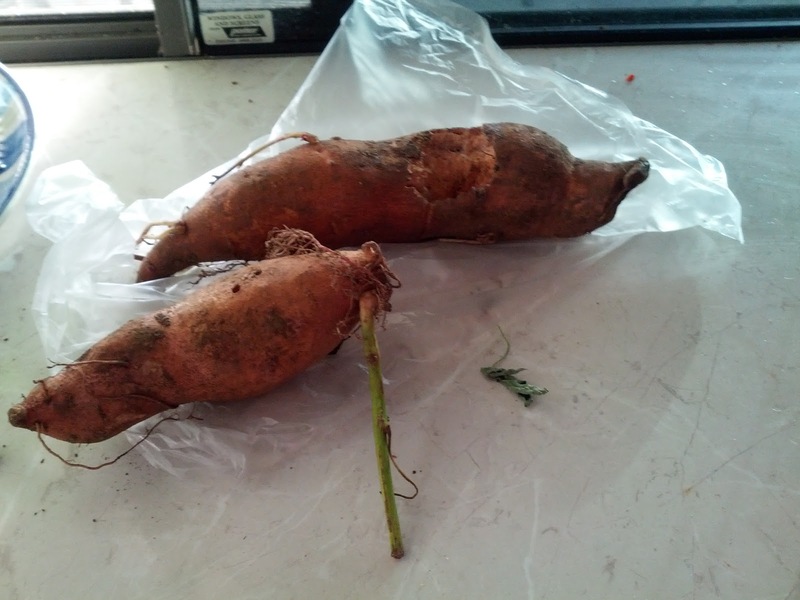 As I can’t expect a house/animal sitter to look after my veggies too. But I do want to get the existing garden in top shape, so it also doesn’t need a lot of TLC in our absence. But I don’t want to have to put our garden on hold either, after all its just a few days. So this week I have a few things still to plant out from the plants I bought last week; a punnet of zucchini and a punnet of cucumbers, which require construction of a new frame to climb. Along with a few cuts of 2 sweet potatoes that I got from a friend, that had begun sprouting. I intend to cut sections around the shoots and plant these in the lower part of the vine garden. Just goes to show, there are alot of fruit/ veggies out there that are in your cupboards/ fridge that will propagate and produce more.